Today seems to be THE day for medium-sized dogs to win goodies here. Cassie G. won the Paw Care Kit shown above that includes 4 booties, a shampoo sample and some paw balm from Canine Earth. Congratulations Cassie! We hope your pup gets some good chilly-weather playtime in with these booties. Our second fun prize for a medium-sized Fido is this gorgeous Snowflake design fleece hoodie from Petco. As adorable as it is on Oliver, I had to tape it for modeling, as it is too large to connect the Velcro on him. We hope that Lori Miller's pup will enjoy this snuggly hoodie. Congratulations to you, Lori! Watch for an email from my AllThingsDogBlor@gmail.com account. I'll need to confirm your shipping address and your prize will go out next week. 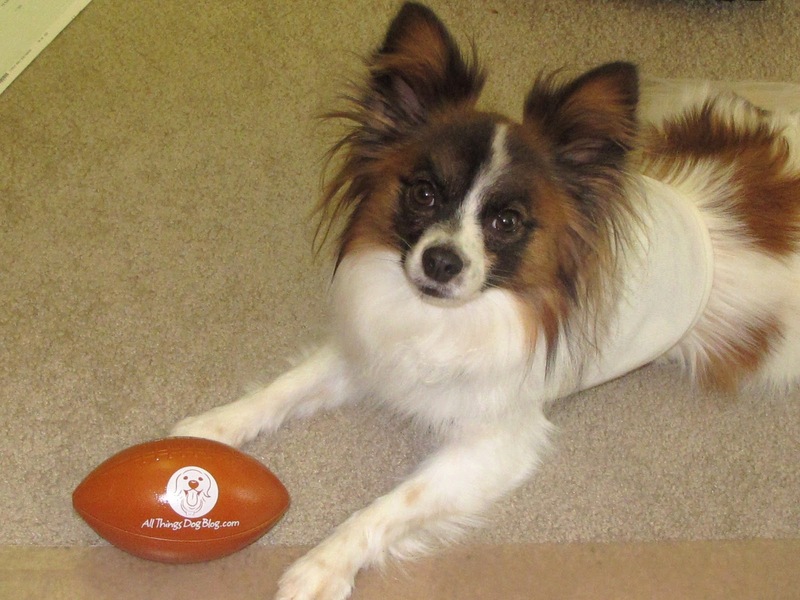 If you ladies are interested in participating in the upcoming photo contest, Super Dog Sunday, I'll be happy to include a small football to be used as a photo prop. Let me know if you're interested in this option. Happy tails! Full disclosure: The paw care products were given to me in conference swag bags. I am under no obligation to give them away or write about them. Petco provided the Snowflake hoodie as a promotional giveaway. There was no purchase necessary to win these giveaways. Please consult my Giveaway and Contest Rules for more information.